The youngest player, Kim Si-Woo of the PGA Tour Players Championship! Kim Si-Woo (22, CJ Logistics) recently won the PGA Tour Players Championship, the youngest player ever to do so. The golf event was held at Sawgrass TPC Stadium in Ponte Vedra Beach, Florida. In the final round, Kim Si-Woo rose to the top of the standings with a birdie putt of over 7m on the seventh hole (par 4) after starting at fourth place behind co-leaders Kyle Stanley and J.B. Holmes. Afterwards, in the remaining nine holes, Kim began to close the gap. Kim clinched the championship trophy by closing 10-under 278 in the final round. Kim Si-Woo won his second trophy after recording his first PGA Tour victory in nine months since notching up his first PGA Tour victory at the Wyndham Championship in August last year. Kim’s feat was more meaningful in that he became the second player to win the Players Championship after Choi Kyung-Ju in 2011. In addition, Kim’s winning of the crown catapulted him to a career-high rank in world golf. According to the men's golf world rankings announced shortly after the contest, Kim’s standing soared to 28 from 75 and is currently the highest among Korean golfers. Furthermore, through this event, Kim, who secured a seed for the PGA Tour for the next five years, will be eligible to participate in the Masters, the US Open, and the British Open. The Players Championship is an international golf tournament which rivals four major international competitions in men's golf: the Masters, the US Open, the British Open and the PGA Championship. World-class players such as Jack Nicklaus, Tiger Woods, Phil Mickelson and Sergio Garcia won the trophy in this tournament before Kim. At the age of 21 and 10 months, Kim was able to create a sensation as soon as he returned to the PGA as well as Korea. 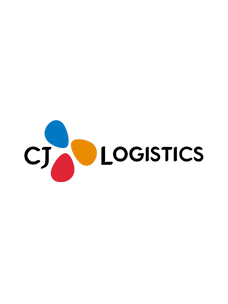 CJ Logistics has been sponsoring sports since 2016 to support golf players with talent and potential, including Kim Si-Woo. 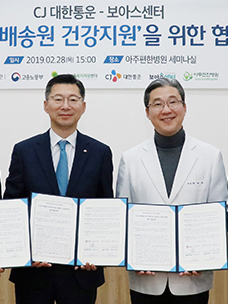 In addition, the company actively supports six golfers such as Lee Kyung-Hoon, Lee Dong-Hwan, Lee Soo-Min and Ahn Byung-Hun so that they will be able to spread their wings. Since last year, CJ Logistics has also sponsored Super Race, the largest car race in Korea. On the other hand, Kim's excellent performance he showed at the major tournament can be seen at THE CJ CUP which will begin on October 19. At this time, CJ is going to make more efforts to help Kim and proud Korean players play well. 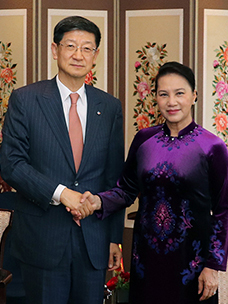 We ask you for strong support for Kim.